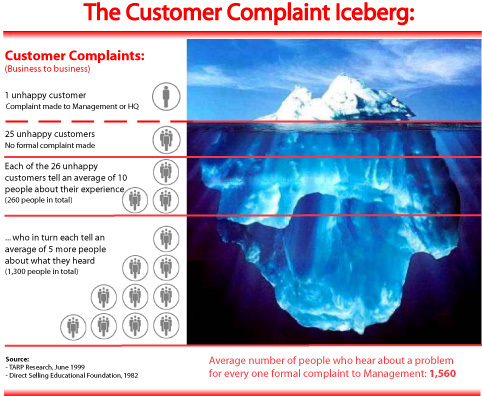 Free Article: The Customer Complaint Iceberg ..|. Written by Paul Quinn. Stop! Before you dismiss last week's customer complaint as unimportant, consider this: research by US firm TARP shows that for every 26 unhappy customers, only one will lodge a formal complaint with Management. The real concern, however, comes from the finding that an average of 1,560 people will hear about at least one of these unhappy customers' experiences. That's right. On average, each unhappy customer will tell 10 people, who in turn will tell 5 others. This finding makes for a compelling wake up call for businesses that take the task of collecting and responding to customer feedback lightly. Send a shiver up your spine? It's bound to generate anxiety in any recruitment organisation serious about generating positive word of mouth and building strong brand awareness. Indeed, recruiters need to understand that soliciting ongoing client and candidate feedback - both good and bad - is crucial to their continued success. How do you collect feedback? Companies should look upon every interaction with their customers as an opportunity to gather feedback. The most effective way to do this is to develop a multi-channel customer feedback system that encompasses opinion from clients, candidates and staff. (i) Accessibility - You limit a customer's access to providing feedback. Your customer feedback system must be flexible enough to allow customers to provide you with timely comments no matter how they come into contact with you. (ii) Convenience - Offering only one feedback channel limits feedback from customers who wish to interact with you via a different channel. It's no good, for example, only offering candidates a postal address to submit feedback if most of them prefer to correspond with you via the Internet. 1. An informal and/or unstructured verbal feedback process. 2. Feedback not recorded (for later action and review). 3. Feedback system not 'owned' or 'championed' by Management. 4. Poor feedback communications loop (to advise on outcomes and action plan). 5. Feedback sought too infrequently (once a year is not enough). Lack of Consistency - a lack of consistent criteria to evaluate and record feedback. Lack of Accuracy - often the difference between what the customer said and what the consultant heard can be substantial. Confrontational - would a hiring manager feel comfortable about telling a consultant that they performed poorly in a face-to-face (potentially confrontational) situation? Some hiring managers may. Most won't. Accordingly, relying on an informal face-to-face customer review performed by the consultant who conducted the assignment is clearly not the best method of gaining quality customer feedback. The widespread use of the Internet and the advent of online survey technology is making the customer feedback process easier than ever. Fast and cost effective, online systems enable the recruiter to instantly receive customer feedback, collate information and view reports in real time. In addition, response rates are frequently higher than paper-based surveys as online surveys are usually quicker and more convenient for respondents to complete. A major ASX-listed organisation conducts monthly post-service feedback surveys with clients and asks respondents to 'tick the box' if they have raised any issues that they would like a 'Quality Manager' to follow up with them over the phone. A small Melbourne-based recruitment firm surveys clients on a quarterly basis regarding hiring intentions and salary levels and then distributes the feedback to clients as part of their newsletter. A large Sydney-based consulting firm uses client feedback as part of their consultant performance review process. A below-average client satisfaction rating for a particular consultant can indicate a 'red flag' issue that needs to be addressed by Management. A large corporate employer in Brisbane uses an online survey tool to quiz candidates about the effectiveness of their recruitment process and provides an incentive to candidates for the submission of ideas on how the process can be improved. Online feedback systems should not be used in isolation, however the benefits of speed, cost, accuracy and convenience over traditional paper-based survey techniques ensure that online feedback systems in the recruitment process are becoming more widely used and accepted. Ask For Feedback - Then Take Action! Remember too that asking for feedback alone is not enough - you must make the commitment to establish an effective customer feedback response process that addresses each issue that arises. In doing so, you not only encourage people to continue giving you feedback (because they know that you'll do something about it), but research also shows that between 54-70 percent of business from complaining customers can be won back if the process is handled promptly and professionally. Feedback: A client completes your online post-placement feedback survey and highlights his disappointment with a reoccurring problem relating to the coding and layout of his invoices. He says that after a number of prior requests to address the issue this latest occurrence is the final straw and he intends on taking his business elsewhere. He also indicates he's willing to talk with the company's Quality Manager about his experience. Action taken: Within 20 minutes of receipt of the feedback, the Quality Manager phones the client, listens to his concerns (without defense or judgement) and commits to promptly investigate the problem. Within 24 hours the Quality Manager has talked to the Accounts Department, identified the appropriate steps to resolve the issue, and called the client back to go though the five actions the company is taking to address the situation to ensure it never happens again. Key message to aggrieved client: (i) we listen and don't blame or pass the buck, (ii) we are responsive to your needs, (iii) we are committed to improvement, and (iv) we value your business! End result: Avoided potential client defection, and stimulated positive word of mouth as the client tells other colleagues and associates about the timely and professional response he received. Offering a system that makes it easy for your customers to provide you with regular feedback is not only good business practice - it's plain common sense. By letting you know when they are unhappy, customers give you a golden opportunity to correct the immediate problem, restore goodwill and avoid the negative word of mouth that results from the phenomena known as 'The Customer Complaint Iceberg'. Actively seek and encourage feedback - remember the 'Customer Complaint Iceberg' and understand that no news is BAD news. Every customer interaction is an opportunity for feedback. Develop a multi-channel customer feedback system that enables you to capture, record and report information quickly and easily. Leverage technology to aid your efforts. Follow up issues. Review feedback regularly. Commit to a process of constant customer-driven improvement. Complete the feedback loop. Give prompt feedback to your clients, candidates and staff about the actions you've taken, or intend to take, as a result of the feedback you've received. Encourage them to keep the dialogue with you open. Reinforce you're listening, and that you genuinely care what they think. Interested in trialling an Australian-built online customer feedback tool? PeoplePulse is an Australian built online feedback and survey tool used extensively by Australian and New Zealand based organisations from ALL industries to conduct online customer research, climate surveys, and training surveys, to name a few popular uses. Please complete the form below to arrange your FREE demonstration and to receive a PeoplePulse pricing and information sheet. Upon completing the form below, Quinntessential will contact you to better understand your needs and unique situation. From there we will arrange a suitable time to demonstrate the system with you. Direct Selling Educational Foundation, a Washington, D.C. not-for-profit public educational organisation. "Customers Mean Business... Survey Shows You Have More Dissatisfied Customers than You Think." 1982. © 2005. Written by Paul Quinn, Managing Director of Quinntessential Marketing Consulting Pty Ltd. Reprint with permission.